Yes, they can be worn different ways. Material and construction are the key to any technical garment and the Garuda SS C8 features 3XDRY treated fabric from Schoeller and some very roomy, articulated construction with plenty of storage. 3XDRY is a moisture management treatment that makes the fabric water, dirt, odour and stain repellent from the outside, dry super quick and evaporate sweat quickly as well, cooling the skin down in the process. On hot days these pants perform as well as any twill trouser would, but wick sweat faster and without sweat stains (a real problem if you wear black in the summer and walk a lot). Breathability is at regular cotton levels. On rainy days, the treatment causes any water hitting the surface to bead, up to a certain limit beyond which the fabric does get wet. I’ve been in the rain a bunch of times in these the past month and unless you’re walking slowly in a heavy downpour, you’ll be fine in these. They are astonishingly quick to dry as well. Breathability however, does take a hit as the fabric takes on water. As far as the winter goes, I’m yet to try these out and I am sure they won’t do too bad but I’d rather wear heavy denim because I’m extra sensitive to the cold. Talking about storage, the pants feature a total of 7 pockets that can hold anything from your metro card to a telephoto lens, securely. The left side features aviator style tiered pockets in front of the regular pocket which are quite deep and very handy. The right side has a large cargo pocket with magnetic closure and a slip pocket behind it, which is pure genius and the pocket that I use the most! The magnet can hold a multitude of objects in place but also gets stuck to cars and metal shelves as you walk past them (minor inconvenience). Never losing keys again but I stick them on the inner side duh. The overall construction is solid and they fit really well. Roomy in the crotch with a straight taper down and a drawstring with belt loops at the waist. But what I love about these is the variety that they offer. The hem is stepped and can be inverted to be worn like a cropped pant. On really hot days I pull these up to a capri length that helps my legs breathe a bit. The hem comes with shock cords that tighten and drastically alter the fit. Stretch in the fabric and articulated knees mean that you can run in these; I even played basketball in them with no snags. If you’re looking for that ninja vibe then keeping the hems tightened is the way to go for you. 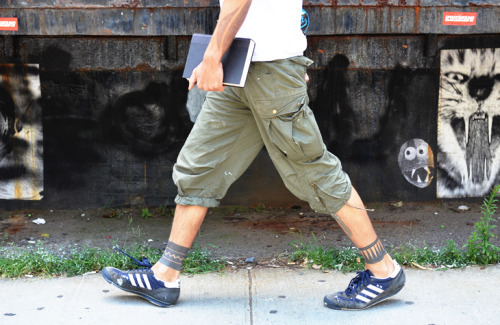 With a multitude of options, these pants can be styled well with sneakers, boots or even sandals if the weather demands. These pants have become my go-to for everyday wear and everything else feels weird/ is too constricting/lacks storage. I’ve probably worn these every day for the last three months and am yet to wash them because there hasn’t been a reason to. Twill isn’t the same as raw denim but the button on the waist has developed a patina and I’m excited to see if the rest of the garment develops signs of wear after washing. I see these pants as an investment (they cost about 19,000 INR) that has helped me slim down my wardrobe to a point where I’ve got a sort of daily uniform down for myself and taking a step away from shopping excessively. This is urban techwear done right – offering utility and advanced features without looking like something out of sci-fi. If Garuda SS does make these in other colors – I’d be first up to cop.